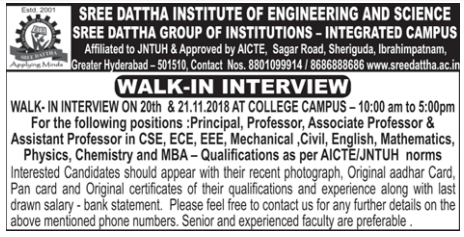 Sree Dattha Institute of Engineering and Science, Ranga Reddy has advertised for recruitment of Teaching Faculty- Principal / Professor / Associate Professor / Assistant Professor jobs vacancies. Interested and eligible job aspirants are requested to walk-in on 20th and 21st November 2018. Check out further more details below. About College: Founded in 2001 by Vyjayanthi Educational Society, Sree Dattha Group of Educational Institutions represents a rich tradition of excellence in technology-based education. A premier-league institution among the affiliates of JNTU, Sree Dattha Group of Educational Institutions owes its vision to Sri G. Panduranga Reddy, a veteran statesman of Independent India. The rapid rate of technological advancement and the information revolution has opened new challenges as well as opportunities.